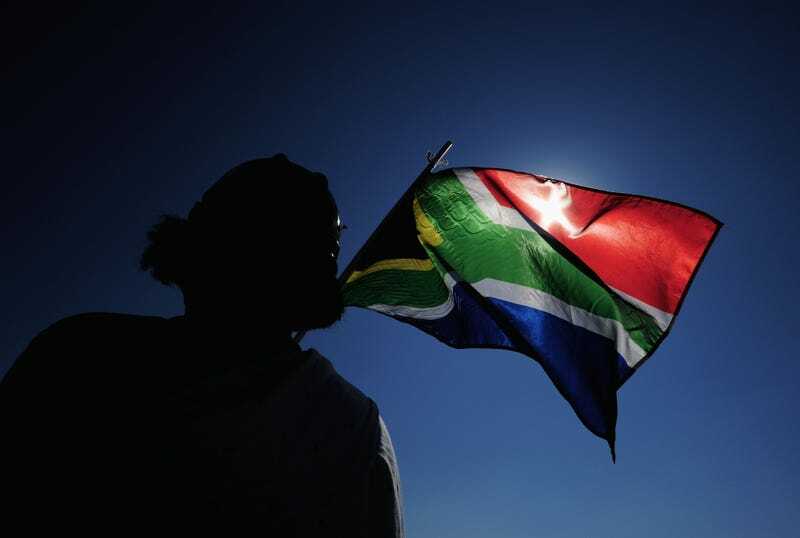 A South African flag is waved ahead of the 2010 FIFA World Cup. On Tuesday, South Africa’s Parliament voted to move forward a potential constitutional amendment that would allow the government to confiscate white-owned land without offering any form of compensation in return. Frequently referred to as “land expropriation without compensation,” the motion was brought forward by Julius Malema, according to the Australian news site news.com.au. Malema heads the Economic Freedom Fighters, a radical South African socialist party. The motion passed by a substantial margin of 241 votes for and 83 against. Currently, white South Africans make up 8 percent of the country’s population, yet a 2017 government audit found that they own 72 percent of farmland in South Africa, according to Bloomberg. South Africa’s new president, Cyril Ramaphosa, also supported the motion, with amendments. In fact, Ramaphosa, who assumed power earlier this month following Jacob Zuma’s ouster, made land expropriation “a key pillar of his policy platform,” news.com.au writes. While the overwhelming majority of the South African Parliament members support moving the motion for land expropriation forward, it’s been met with vehement opposition from a handful of parties: the Democratic Alliance; Freedom Front Plus, which represents white Afrikaners; COPE; and the African Christian Democratic Party. The sentiment was put more forcefully by Ernst Roets, deputy chief executive of Afriforum, a minority-rights (read: white South African rights) organization. Roets said that the motion violated a 1994 agreement in which the ANC promised that the interests of minorities would be protected postapartheid. In a statement, Roets said that the motion was “based on a distorted image of the past” and was “nothing more than racist theft”—kind of like colonization, one supposes. He went on to say that it wasn’t true that “white people who own land necessarily obtained it by means of oppression, violence or forced removals.” Apparently there was a huge “buy one, get 71 percent more of South Africa’s total farmland” sale that we missed in the history books. A special committee will review the constitution to make the necessary amendments, with a report due back to lawmakers on the proposed changes by Aug. 30.